A former Salina quarterback has been named as the first head coach of one of the new expansion franchises in Champions Indoor Football (CIF). Chris Coffin, who was the starting quarterback for the Salina Bombers during their final season in 2015, was named the head coach of the Kansas City Phantoms, according to a media release from the team on Wednesday. Coffin, who played college football at Graceland University from 1994-1998, started his indoor football playing career in 2003 with the Kansas Koyotes of the American Professional Football League (APFL). Coffin started for the Koyotes from 2003-2007 and was a five-time league Champion and a four-time league MVP. He also received the APFL Player of the Decade award. Coffin was idle in the football world from 2009-2013. 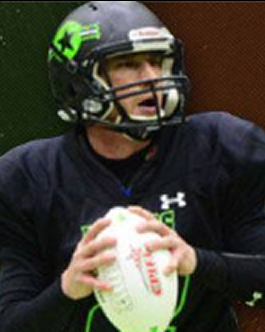 He returned to action in the CIF’s predecessor, the Champions Professional Indoor Football League (CPIFL) in 2013. He played for the Kansas City Renegades in 2013, the Omaha Beef in 2014 and finally in Salina in 2015. In Kansas City, Coffin was twice named in the CPIFL Player of the Week and set a league record with eight touchdown passes in a single game. While in Omaha, Coffin broke his own league record, throwing nine touchdown passes in a single game and was the first player in league history to throw for over 300 yards in one game. He was also named CPIFL Offensive Player of the Week on two occasions while playing with the Beef. While in Salina, Coffin was the starting quarterback for the Bombers as well as their offensive coordinator. He led the CIF in regular season passing touchdowns with 52 and in passing yards with 2,285 in 11 starts. Coffin was named CIF Offensive Player of the Week twice and was named CIF’s 2015 CIF Offensive Player of the Year. Coffin becomes the first head coach in the history of the Kansas City Phantoms, an expansion franchise that will begin play in 2017 at the Silverstien Eye Centers Arena in the Kansas City, Missouri suburb of Independence.